It is not difficult to make impressive Bridal shower invitations, with a bit of time and know how you can create beautiful DIY invitations that reflect your own style. If you are going to make digital invitations then search for bridal shower clipart on the internet like umbrellas, shower heads, rain, gifts, bride silhouettes, tea pots or other images to suit your bridal shower party theme. DIY calligraphy is a clever technique in which you print your invitation wording using a fancy font on to your card. The text needs to be a shade lighter than the card itself and printed with minimum quality settings so that when it prints you can barely see it. Then all you do is trace over the text with your store bought calligraphy pen. This is a terrific technique to use on your envelopes which invitation etiquette demands they be hand written. Vintage images of women are en vogue, also a nice silhouette of an elegant bride makes for a good background on an invitation. 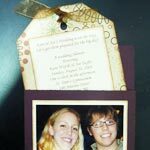 Shape your lingerie party invitations into the form of some fancy brassiere trimmed with frilly crepe paper or lace. Since a kitchen tea party generally involves the guests bringing household or kitchen gifts for the soon to be wed bride and groom, it is a good idea to plan your invitations with that in mind. A wooden spoon with a simple tag tied to it with ribbon or string is one idea. Type the party details on to an A4 sized card 8 or so times and cut them out in the shape of a tag, punch a hole in the tag and tie to the spoon. A card like an oven that opens to reveal all the party details. Get dish towels (tea towels) custom printed with your invitation information, you may wish to add it yourself with fabric paint. 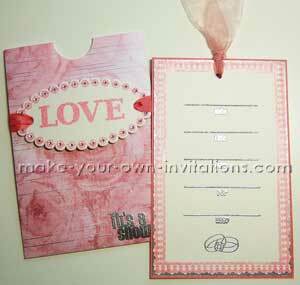 We have a small selection of original and free bridal shower invitation verses to add a bit of fun to your invites. See also our newly added bridal shower invitation wording examples for invites thrown by the bridesmaids, friends and family members. 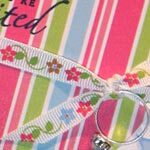 Check out some of these fun and carefree Kitchen Tea or Bridal Shower Invitations that have been hand made and submitted to our gallery by readers just like yourself who thought to save a buck or let their personality shine through their invite design. They are sure to inspire you when making your own party invites.